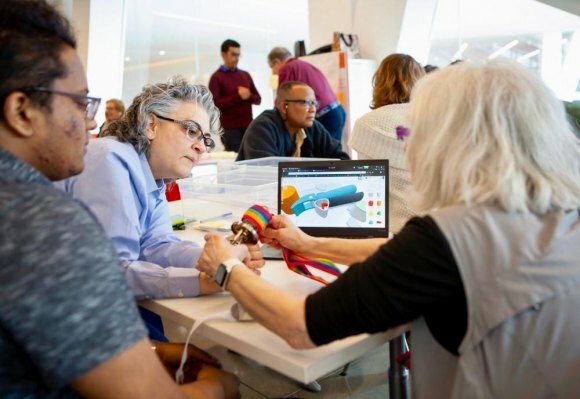 Maker Lab Collaboration with CBN/Roosevelt Island Seniors on display earlier this month. "The Weill Cornell Medicine Clinical & Translational Science Center will hold its 2nd Annual Health Innovation Final Showcase on Friday, June 1st at the Weill Greenberg Center (1305 York Avenue), the culmination of a 3-day Hackathon May 18 – 20, 2018," the group said in a press release. "The goal of the Hackathon is to leverage new and emerging technology to solve biomedical research questions and create a product or solution with potential to benefit human health." "The Hackathon is a collaborative event with participants from Weill Cornell Medicine Clinical and Translational Science Center (CTSC) partners (Cornell Ithaca, Cornell Tech, Hospital for Special Surgery, Memorial Sloan Kettering, Hunter School of Nursing, Hunter College, etc.) as well as schools and businesses in the NY and Northeast Region. "There has also been a unique community partnership continued with residents of the Carter Burden Roosevelt Island Senior Center, one of whom submitted a challenge that a team is working to solve (Team choke rescuer #4). This sprint-like event in which teams of individuals from diverse backgrounds will work together on a specific project will feature a wide range of novel software and hardware solutions, including a custom prosthetic hand, a digital doctor’s kit, a device to assist a choking person who is alone, and a tech solution to help refugee mothers with breastfeeding, among others. "After the Hackathon weekend, teams have an additional two weeks to finalize their projects and present before a panel of judges at a Final Showcase on Friday, June 1, 2018. This event will be an excellent time to see how each team has risen to the challenge of solving the question posed to them and will be a first look at some ideas that may soon widely benefit patients in a clinical setting or positively impact public health." The Daily has been invited to attend and share this success story. 1. Stuntin’ Shunt: A non-invasive solution for monitoring ventriculo-peritoneal shunt function and malfunction. 2. Digital Doctor’s Bag: 3D printed tools for cost-effective remote diagnostics in telemedicine. 4. Choke Rescuer: wearable anti-choking device for seniors living alone actuated by CO2 cartridges. 6. Zleep: An app to efficiently extract information on the pattern of sleep from EEG data. 7. Milky Way: Tech solution to help Syrian refugee moms with breastfeeding. 8. EndoScoop: customizable endoscopic tool for gastroenterologist to perform cavitary debridement.